Julie! congratulations, Julie! we’re so happy for you! we’ll be sending you an email soon to get your info. thanks to everyone who entered! there are still 09 days left to win something! Take two Kansas City book lovers, season them with graphic design careers and a strong desire to travel. Stir up these ingredients and you have Tag Team Tompkins, a mother/daughter team who creates art that honors literary wit and wisdom. We hunt for quotes that speak to us, then add our silhouette illustrations and hand lettering to complete each piece of art. Each piece is then printed in small editions at Skylab Letterpress print shop on carefully selected papers. Our Etsy Shop carries over 50 of our prints and bookmarks. Since opening in mid-2010, we’ve sold over 1300 prints and have many happy repeat customers. note: if you already have done the below items please note them in your blog comment. I’ve left an example comment below of what this might look like. 1. head over to Tag Team Tompkins’ etsy shop, find something you like, then come back here and tell me what it is you like from their shop in a comment. all entries must be submitted before midnight mst today, december 3rd. one winner will be randomly selected and announced on this post tomorrow at 8pm MST. you must be a resident of U.S. or Canada to be eligible. I like “Lost Time is Never Found Again”. I subscribe to livecrafteat. I LIKE livecrafteat and Shared on Facebook. I pinned and tweeted on Twitter. I follow and repinned this post on Pinterest. 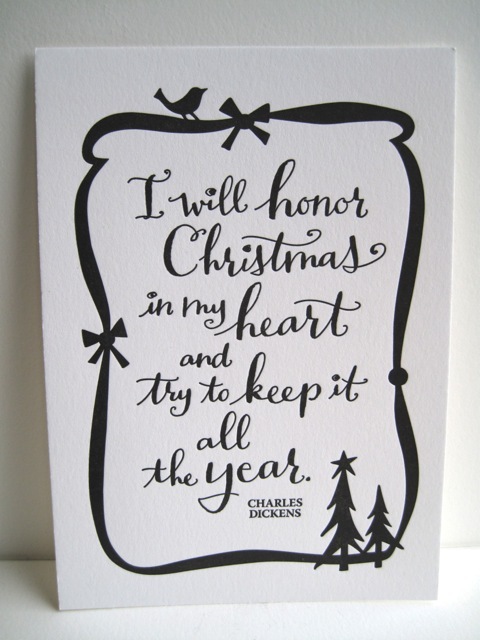 “I will honor Christmas” is my favorite.” I subscribe, shared on Facebook, follow on pinterest, and repinned the image. I like “Where thou art, that is home.” I subscribe, shared on facebook, follow and repinned on pinterest. Thanks! I really like the Bah Humbug one!! So cute! I suscribe, Pinterest is my friend and I follow youI also repinned the above image, retwitted!!!! Book Lovers Never Go to Bed ALone Bookmark! .I subscribe via email.I shared this giveaway on facebook (Tammy Dalley). I follow you on Pinterest (tammy D). I pinned on pinterest. Tweeted on twitter @mommaoftwoboyz. I follow you on google + as Tammy D.
I like “Don’t let your tongue cut your throat.” I ubscribe, shared on facebook, follow and repinned on pinterest. Truer words…. What I really love about their products, though, is that they’re so uniquely done! They don’t have the typical quotes and pics that you find just about everywhere. Great stuff! I subscribe, I like you, and I follow you on Pinterest. P.S. I made the cookie sheet Christmas Countdown – sooo easy – and my kids L.O.V.E. it! Thanks for the great ideas and recipes!!! Liked you on facebook, subscribe to the emails.